Air quality is becoming one of the biggest global threats to public health, putting people at risk for respiratory diseases, stroke, heart disease and lung cancer. According to research released earlier this year, air quality levels exceed World Health Organization (WHO) guidelines for 80 percent of those living in urban areas that track air pollution. In the UK, for example, air pollution is believed to cause between 40,000 and 50,000 deaths a year; in London it may be killing more people than smoking does. Clearly, the quality of the air can have a significant impact on the health of you and your family. But according to the Environmental Protection Agency, the air inside our homes and businesses is five times more polluted than that of the outdoors. The question now becomes how to combat that on an individual level — and smart devices provide some interesting solutions. There are a significant number of connected, Internet of Things-powered devices that incorporate some sort of indoor air quality (IAQ) monitoring that can help mitigate indoor air pollution. From standalone IAQ monitors and devices that do double duty as security systems to smart HVAC systems that filter the air when dangerous levels occur, consumers can now easily monitor the health of their homes and businesses. Particulate matter: Dust and fumes that can go straight into our bloodstreams through our lungs may be lurking in the air. Classified as PM 2.5 (fine particles less than 2.5 micrometers in diameter) and PM 10k (coarse particles 2.5 to 10 micrometers in diameter), these can enter the lungs, bloodstream and heart, as well as irritate the eyes, nose and throat. WHO has classified particulate matter as the world's largest single environmental health risk, causing significant increases of respiratory and heart disease, strokes and lung cancers. The EPA says the elderly and small children are especially at risk. VOCs: These toxic compounds are released by materials in our homes and workplaces, both natural and manmade. A major source of volatile organic compounds are paints, stains, glues in furniture and cleaning sprays. Humidity: Too much humidity can encourage development of black mold in the home, whereas air that's too dry can cause dry skin and sinus irritation. Carbon dioxide: High levels of CO2 can impair cognitive functions. By having some type of smart IAQ monitoring in your home or business, you can measure VOCs, humidity, particulate matter and carbon dioxide and be alerted if they rise above potentially dangerous or uncomfortable levels. Until recently, IAQ monitors were out of reach for regular home and business owners, but today consumer IAQ devices are readily available, and some smart home products even have IAQ monitoring built in to them. IoT-powered IAQ devices can use features such as an internet connection, machine learning, cloud computing, data analysis and artificial intelligence to effectively monitor indoor air quality on an ongoing basis, allowing you to more easily identify and mitigate the causes of poor air quality continually. The benefits are substantial, from keeping your family safe (poor IAQ is linked to the development of asthma and mental illness in children) to improving your workspace by identifying and eliminating allergens and lowering CO2 and VOCs, which have been proven to impair human cognitive function. Providing healthy clean air to your employees will increase productivity and employee satisfaction. Home security systems. Some connected home security systems, such as the Canary All-in-One Security System, incorporate humidity, temperature and air quality sensing to provide a holistic approach to home security. It's not just about motion sensing and video feeds that keep your home safe when you're away, but also about keeping the air in your home safe when you are there. Canary specifically monitors overall changes in air quality caused by pollutants including: iso-butane, carbon monoxide, hydrogen, ethanol, cigarette smoke and cooking odors. IAQ monitors. Companies like FooBot and Netamo have produced standalone consumer-grade IAQ monitors that continually monitor humidity, air quality and temperature. They feed the data directly to your smartphone and interpret it so you can act on trouble areas. Moisture sensors. Simple sensors, such as the Wally moisture sensor, will not only alert you to the dangers of a leak, but will also measure the humidity in the air and alert you when it rises or drops. 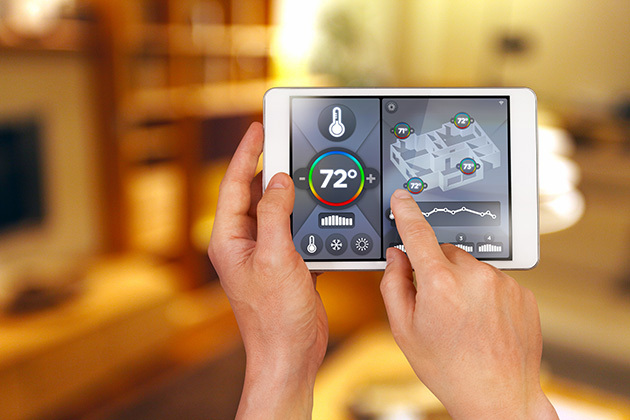 While the ability to easily monitor the air inside is a big step forward, the connected home can really shine by acting on this information intelligently. For example, these smart IAQ monitors can connect to other smart devices in the home and activate them when needed. This includes turning on a smart ventilation system, such as activating a connected thermostat to run the home's air through the whole house filter. Additionally, unconnected devices such as humidifiers, dehumidifiers or air filters can be plugged into smart plugs, which IAQ devices can activate when it senses a need for their services. The dangers of air pollution are real and rising. Taking these small steps in your home or business to breathe better is a significant step toward better health and better awareness of this increasingly pressing global health issue. Jennifer Tuohy immerses herself in technology to provide the latest solutions to everyday problems. From smart air solutions to security options, Jennifer has got you covered. Click here to see some of the surveillance camera systems mentioned in this article, or visit The Home Depot.